Meatballs are one of my favorite dishes.They feel so homey and comforting. You can eat them during any season, and they are super versatile. I have been trying to perfect my meatball recipe for a very long time now and I’m happy to say that as of a few months ago I accomplished that goal! Not only is the seasoning just right, but it tastes equally delicious with any type of meat. Well actually, I’ve only tasted it with lamb and ground beef, but I’m sure its just as delicious with turkey. The first secret is the seasoning. Now, I’m not really a measuring person, I just shake each spice into the mixing bowl containing 1 lb ground meat (I used lamb today) so that you get a thin coating on the top. 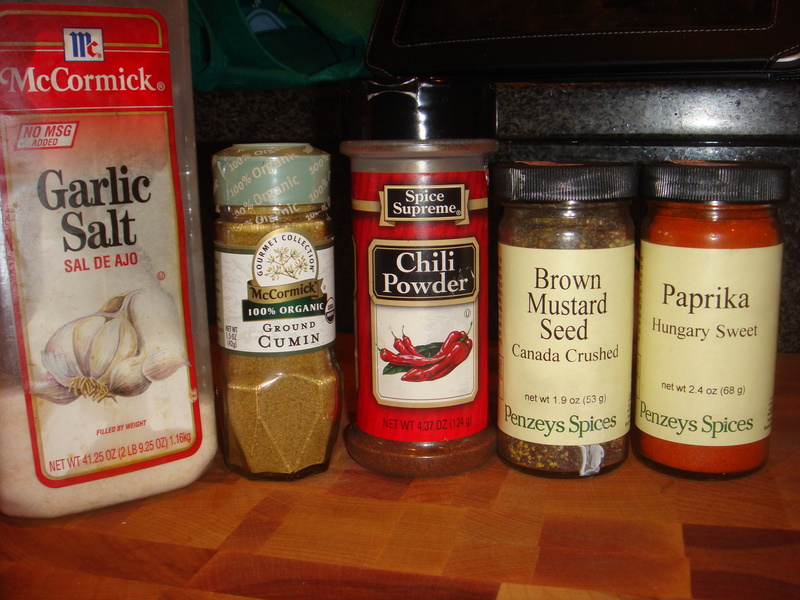 If I had to guess, I’d say it’s about 1tsp of each spice above (Garlic salt, cumin, chili powder, brown mustard seed, and paprika). Now if you don’t have brown mustard seed, you can use some ground mustard or some regular mustard (which is what I used before I got ground mustard seed). Yep, that’s right. 2 TBSP Greek Yogurt and 1/2 cup Panko Breadcrumbs to be exact. 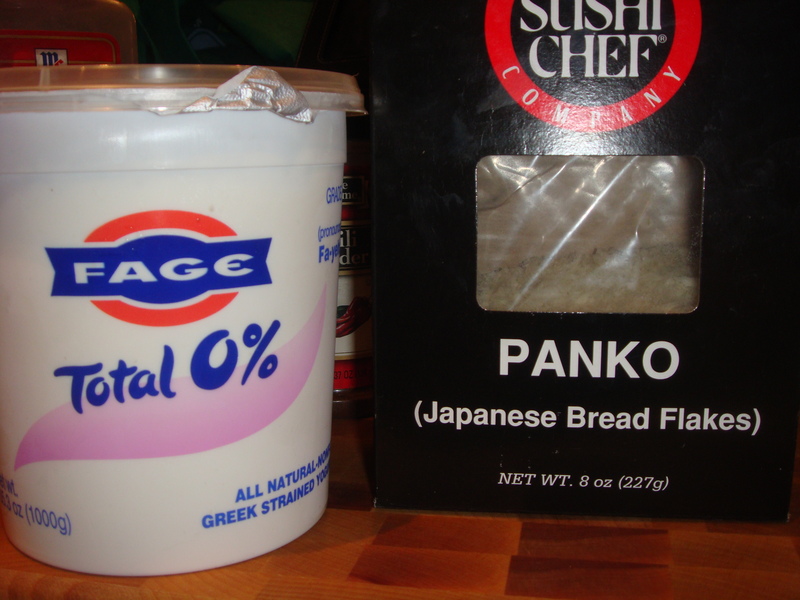 The Greek yogurt serves 2 purposes: 1. It acts instead of eggs as a binder and 2. it keeps the meatballs extra moist. Panko breadcrumbs are great because they add a much better and lighter texture than normal italian seasoned breadcrumbs. Once the onion, meat, seasonings, yogurt, and breadcrumbs are in the bowl mix gently until combined. You don’t want to over-mix meatballs otherwise they get really dense. 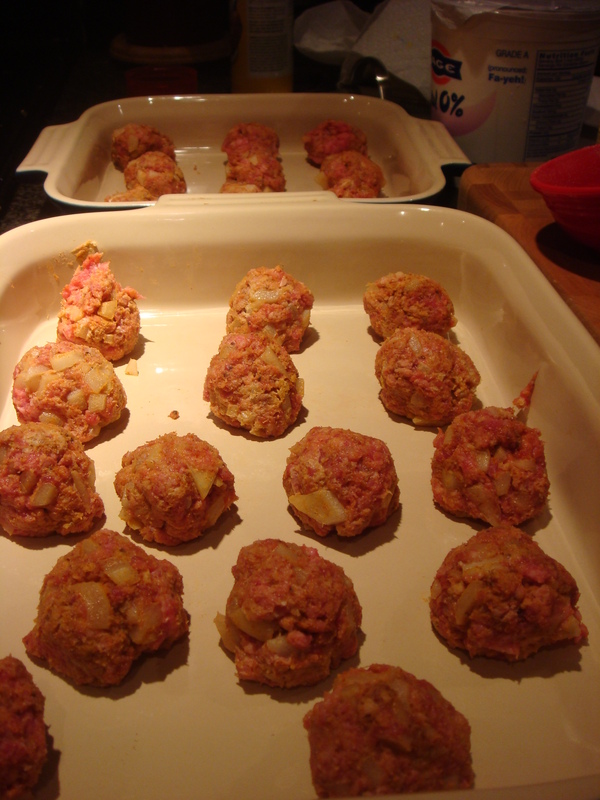 Form into small balls of equal size and place in oven-safe baking dish. I usually get about 20 small meatballs out of 1 lb of meat. Bake at 375 for 25 minutes. Enjoy while hot. And there you have it. My recipe for perfect meatballs. If you’re cooking for a larger crowd and want to cut down on the fat content, I suggest using 1lb of ground lamb and 1 lb of lean ground turkey. The fat from the lamb will help keep everything moist and delicious while the turkey lets you make twice as much food without all the extra calories.